NOTE: This post was voice-dictated the day after major surgery on my right shoulder. In late October 2014, I had an epic mountain bike crash down a cliff and slammed my right shoulder into a redwood tree. This was the same shoulder that suffered an extreme separation wresting in college. I pretty well shook that off, but changed sports to soccer. And the same shoulder that was badly injured as a volunteer diver with the NY State Police during a flash-flood/whitewater vehicle rescue/recovery. I shook that off too. While out running (to try and shake off the pain in my shoulder) in early November 2014, I was sprinting like crazy to make a green light. A car pulled into a driveway right in front of me. I avoided being hit by the car, tripped, went airborne and ... yep, slammed that very same unlucky shoulder into a utility pole. I made the green light and kept on running with what I thought was one more pretty bad shoulder sprain. I finished my run got home and realized it was probably the worst shoulder sprain ever. It was the weekend, so I waited a couple of days to see what would happen. Nothing but more pain. When I went to my GP and he said "son you have a really bad rotator cuff injury." So I go to a top orthopedic surgeon who says "son you have a serious rotator cuff injury." Oh, and the bicep tendon is damaged so badly, we' will need to cut it and anchor it to the humerus." As it turns out this injury was inevitable. My surgeon told me I was very lucky this didn't happen when I was backpacking in the Sierras by myself because I wouldn't be able to get down. That would mean having to push the emergency button on my GPS tracker, and be hauled out by helicopter. That would be embarrassing as hell. I do not ever want to be that guy. Anyway, I was able to make contact with the shoulder expert, Dr. Jonathan Goff, at the Mt. Tam sports orthopedic center. He said he hopes to have the surgery so successful that I could return to ice climbing. He hopes. I hope. But only the recovery will tell. I will be in my arm brace for 4 to 6 weeks because of the severity of the injury. And I'm looking at eight months to a year worth of physical therapy before I can get back out and see how well it works. Surgery was the only thing that could fix it. Ripped tendons don't rehab without slicing, dicing, sewing staplling, drilling and suture anchors. For all I know, there was a SawzAll and A ball peen hammer involved. 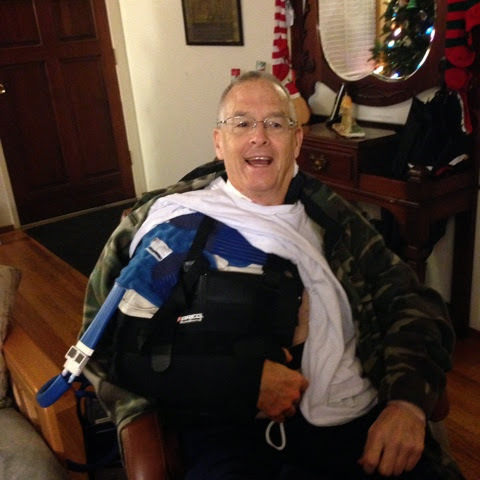 I had the surgery yesterday, and I am recovering in a recliner which will be my chair and my bed for several weeks. I have a cooler machine called a PolarCare which circulates ice water continually through the device on my shoulder. I also have a nifty anesthetic pain pump that continually puts pain medication into a nerve block through a tiny catheter about the same diameter as the sick fishing line. I also have some 100-Megaton narcotic pills which would go for a damn fortune on the street I think. I've never taken pain medication for previous broken bones fractures of the skull pretty extensive stitches and other athletic injuries. But now, here I am, with enough stuff to knock out a moose. I'm expected to need those as the nerve block wears off and actually gets removed tomorrow. That is a long way of saying, that this tactical trekker needs to make a tactical retreat before heading to the mountain again. During that time I will focus on gear. and keeping up-to-date on the rotator cuff injury. I will also be using voice dictation with all of those post, including this one. and that may make for some funky spelling and punctuation. Your tolerance of that greatly appreciated.